As the lead stylist at The Prop Factory, I get to spend a lot of my time styling and photographing the various items we have to hire; be it for wedding ideas, botanical themes or quirky Hawaiian creations, I love the chance to picture props in the wider context and construct a feast for the eyes for our potential customers. 2018 has been one of the most varied and exciting years at the Prop Factory in terms of inventing new concepts and it has been a joy reliving and compiling my top 20 photos of the year! 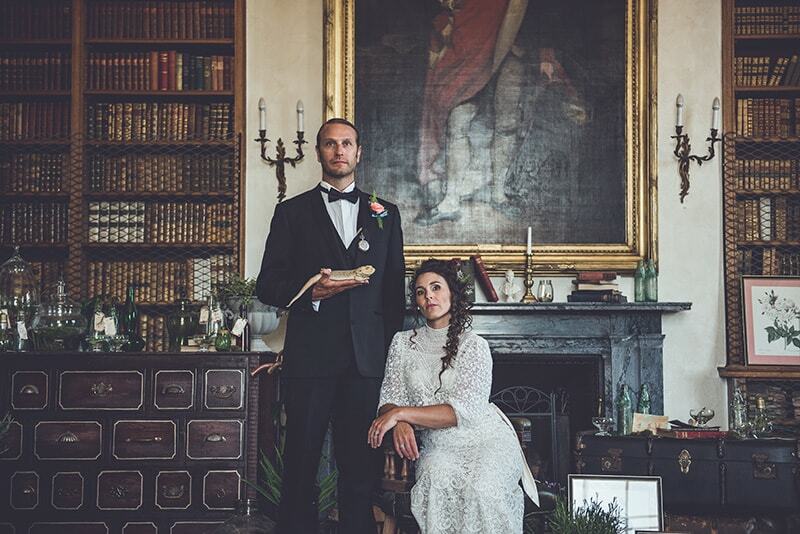 The Victorian Botanical photoshoot in the Library Room at Escot House was - without doubt - my number one photoshoot of 2018. 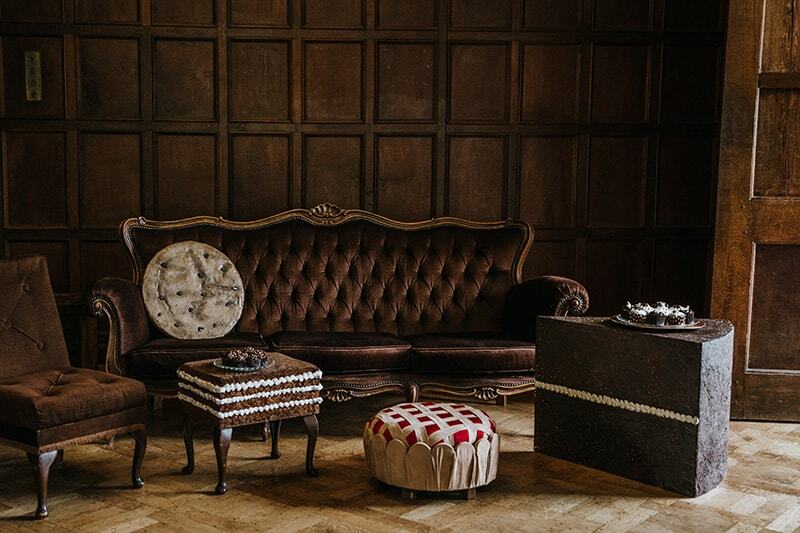 The timeless styling using props such as our Apothecary Bar, Captains Chair and Travel Trunks gave the set such a authentic Victorian look. Once all of our finer details were added (like the medicine bottles, plant illustrations and postcards from around the world) the room looked like it could have belonged to a well-travelled Victorian doctor! Our extra model - Gonzo The Bearded Dragon - added the element of curiosity to the photo that we wanted and the angle and editing by photographer Catherine Spiller gave it a vintage and atmospheric look. This image captures the essence of the whole experience and is my number 1 FAVE! 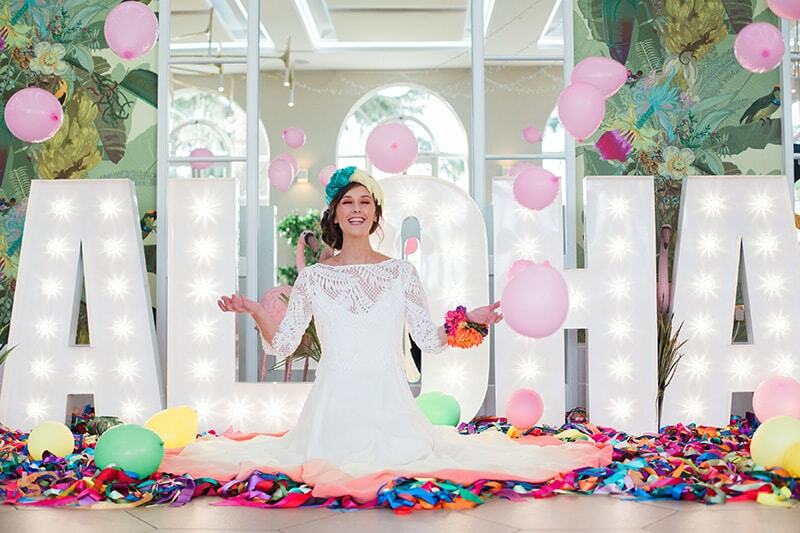 Nothing is on trend like a White Boho themed wedding and this is why it has been placed at number 2 on my list! 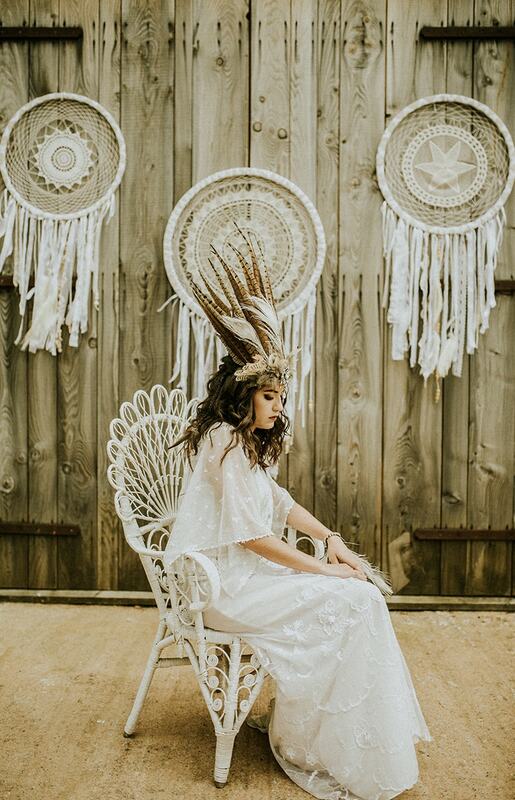 Washed out wood, loose lace and natural feathers make this photo (by Paige Grace Photography) one of my favourites of the year and was featured on the front cover of Wed magazine's October Devon Issue. Our Giant Dream catchers and White Peacock Chair in combination with the barn doors at Ashridge Court Farm make for dreamy wedding inspiration! Bright, Bold & Tropical! Our Hawaiian photoshoot provides my 3rd and 4th favourite images as I just couldn't choose one photo to show. 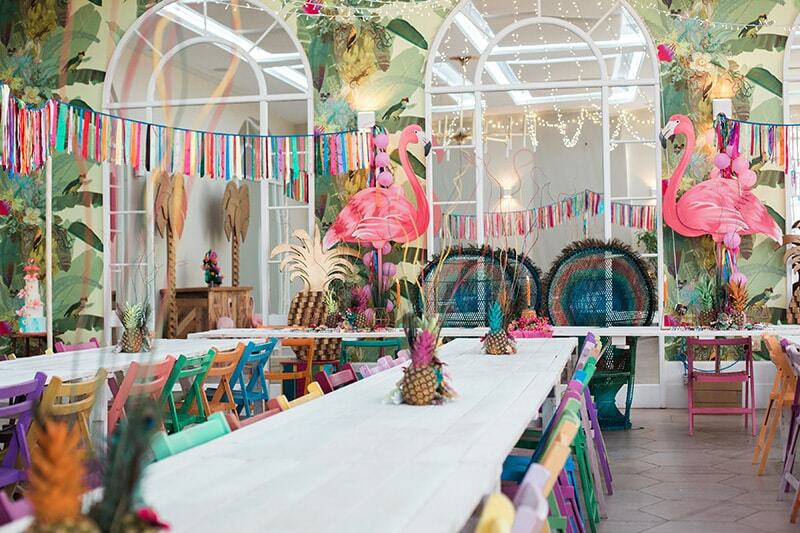 Set up using our white washed Farmhouse Tables, a rainbow of colourful chairs, Giant Flamingos and Peacock Chairs, this room made me feel like I was in a hot and tropical climate...even if it was snowing outside! The wallpaper in Deerpark's Orangery added to the exotic vibes and the Coral Ombre dress by Lucy Can't Dance gave us the ultimate Summer bride goals. Photos by Mimosa Photography. Welcome to our English Country Garden: A garden in full bloom created inside Ashridge Court Farm Barn. I love this idea, as, because weather can play such havoc when planning an outdoor garden party, bringing the outside in is a really viable option. We created this ceremony scene inside the barn by laying down false grass, dressing our moon arch in beautiful real flowers (by Brompton Buds) and lining the borders with pretty potted plants, blossom trees and even a fountain! The White Rope Posts created an aisle for our graceful model who looks like she could have stepped right out of a Beatrix Potter Book and this is why this photo makes it to number 5 of my photos from 2018. The best way to show off our luxurious collection of sofas, chaise lounges and armchairs would be to get them all together for one big Sofa Party! 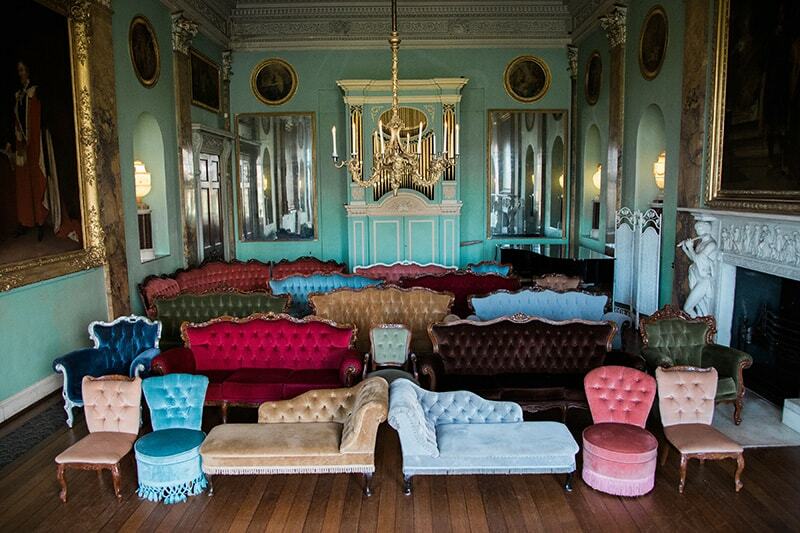 It took 3 van trips and a good few hours to create this grand scene in Powderham Castle's Music Room. The 20 separate vintage pieces compliment each other perfectly and all have an interesting story behind them. This photo showcases them all looking gorgeous together which is why it's number 6 in my top 20! Roll Up, Roll Up: The Circus is here! Presenting a spectacular collaboration with Vicki-Lea Boulter at The Lucky 7 Club for photo number 7. It took one morning to set up this shoot and it was photographed as if we were at a live circus! All acts danced and pranced on our Star Podiums under our festoon bunting and around our circus tents. The final - and my favourite image â€“ from the day was everyone on stage performing and being lit up by our Circus Light Up Letters. Our Farm Fete photoshoot at the very desirable Hugh Fearnley-Whittingstall's River Cottage is my choice for number 8. 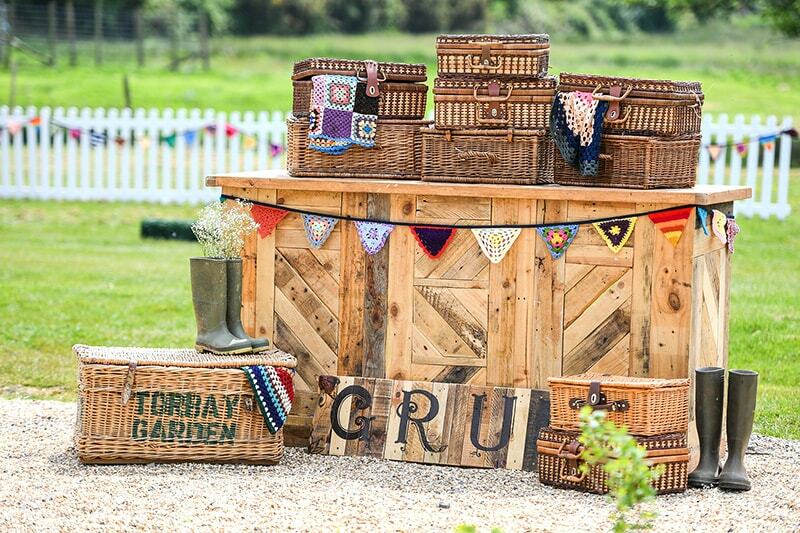 The weather was absolutely stunning and our rustic farm inspired wedding props fitted the laid-back organic vibes that the venue has to offer. Our Rustic Bar piled high with picnic baskets was my favourite setup from the day; the gorgeous wood and wicker tones set against the lush green farm land backdrop was just delightful. I'd have a picnic there any day! Image by by Emily Fleur Photography. The Spring Buttons & Bunnies photoshoot was my first and biggest shoot of 2018 in terms of suppliers involved and so I just had to feature it in this blog post at number 9. Pastels, buttons and bunnies were my initial inspiration and, as the shoot was planned for a cold day in February in the grounds of Bickleigh Castle, weren't we lucky with the sunshine! 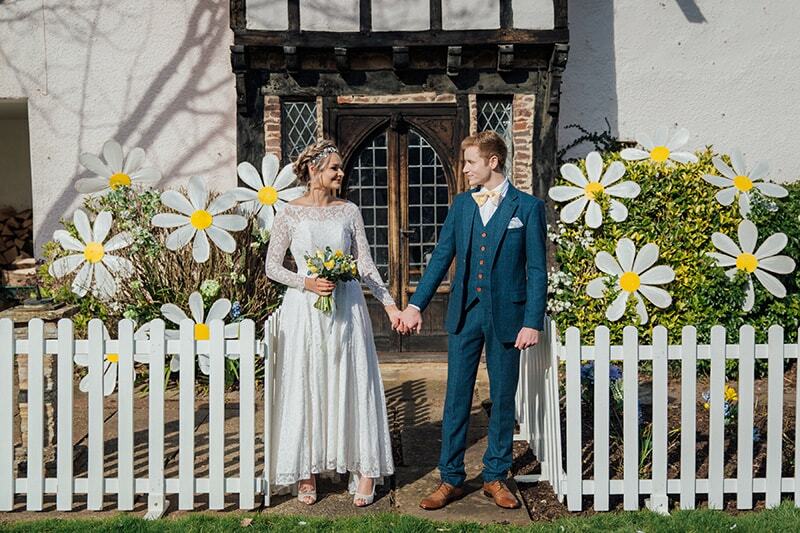 Our white picket fences and giant flowers helped line the castle to create a fairytale wedding. I made an oversized lemon and lace bowtie for Luke - the groom - and chose a beautifully elegant dress for Alice - from Days of Grace - with an accompanying handmade tiara by Blushing Flamingos. 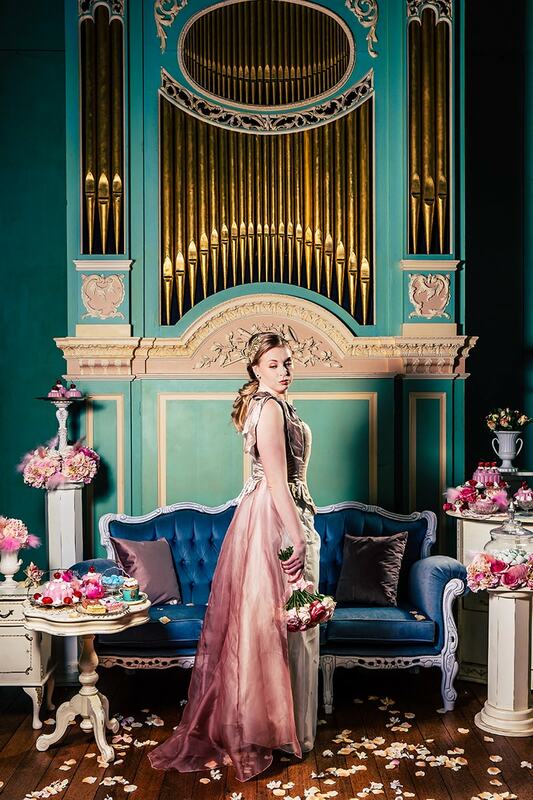 Image by Liberty Pearl Photography, flowers by Darling Buds. Summer 2018 was all about the Bright Festival vibes! Our unique venue was Green Acre, a festival venue with land for camping and permanent tipis! 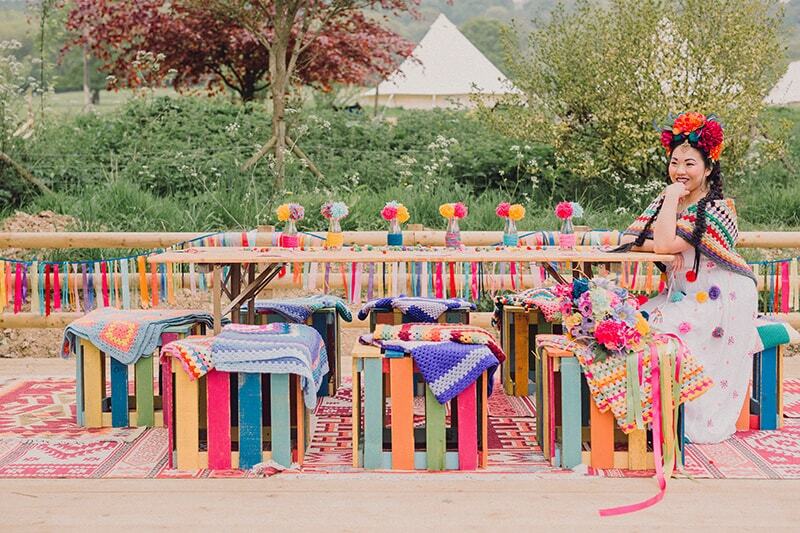 The pom-pom theme was key to this shoot with the creation of a pom-pom backdrop and the theme continued with a bright table setting using our festival pallet stools, festival rugs, crochet blankets and ribbon bunting. I even stitched pom-poms onto the model's dress - as seen in this vibrant photo by Jennifer Jane Photography - and the relaxed, fun nature of this shoot is the reason for it being chosen for choice number 10. What do you think of when you're given the party theme Bubblegum & Candy. . . ? 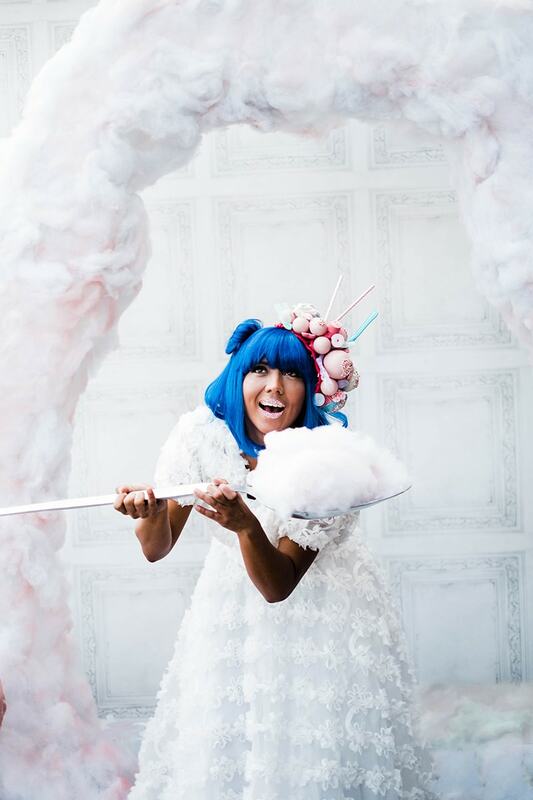 Our creative minds interpreted this brief as perfect for as an arch made of candyfloss, a Nicki Minaj-esque model with a sweets and ice-cream inspired headpiece and a floating pink sofa featuring a candy carousel horse! We have so many yummy props to choose from for this theme and I'd love to recreate it with our even newer candy collection! I think the transformation of our cream metal arch into a candyfloss cloud made this one of my favourites and a sweet option for number 11. Mary Poppins returned to our screens late last year with 'Mary Poppins Returns' and it kick started some themed events we were keen to cater for! One request was to make a bespoke Mary Poppins carpet bag replica and boy did we do ourselves proud - it even has a trap door! The bag sparked off an entire photoshoot idea, inspired by the original 1963 film, and was photographed here at The Prop Factory HQ. Props such as our Wooden Hat Stand, Country Fireplace and Gold Plant Stand fitted the film style perfectly and a short video can now be watched on our Youtube channel. 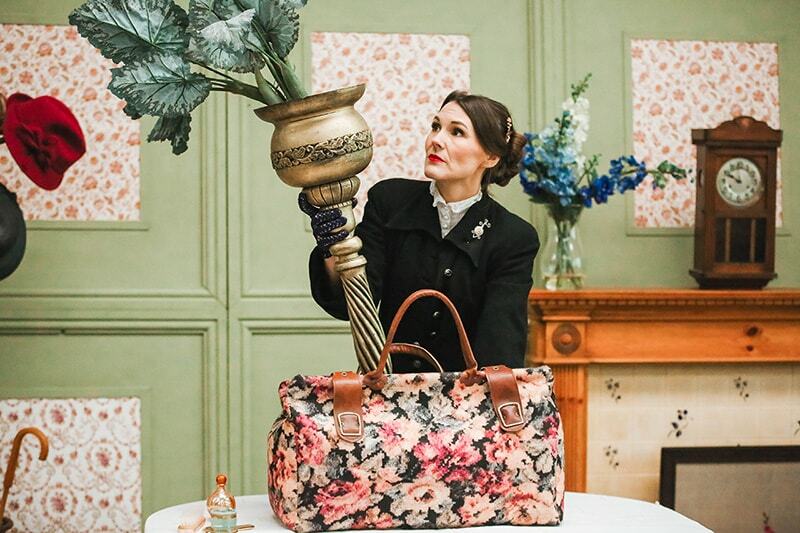 I love this photo of our Mary Poppins model pulling our gold Plant Stand out of her bag...or is she?! A practically perfect choice for photo number 12! Image by SoBell Photography. The most romantic and goosepimpling photoshoot I've ever done was our Country Pub inspired shoot in collaboration with Knots & Kisses and this is why it is my choice for photo number 13 of 2018. The models' musical chemistry was electric and everyone involved in the set up that day just stood mesmerised by them singing and playing to each other on their guitars. The set had a country pub/gentlemen's club vibe and we created a seating area within The Oak Barn using our vintage pub stool, poseur tables, vintage bar and Chesterfield Sofas. Nikki from Knots & Kisses then styled our furniture beautifully with old books, succulents, textured throws and cushions. Image Liberty Pearl Photography. Well this ended up being a lot more scary than planned: our Halloween Circus photo shoot at Ashridge Court's abandoned barn finds its way to photo number 14! Our circus props created the main contents of the shoot with Halloween elements such as cobwebs, pumpkins, blood stained sheets (don't worry, we used ketchup!) and skeleton bones. Our Concertina Style Circus Arch positioned at the entrance of the barn made it look like a haunted house fairground ride . . . do you dare to enter?! 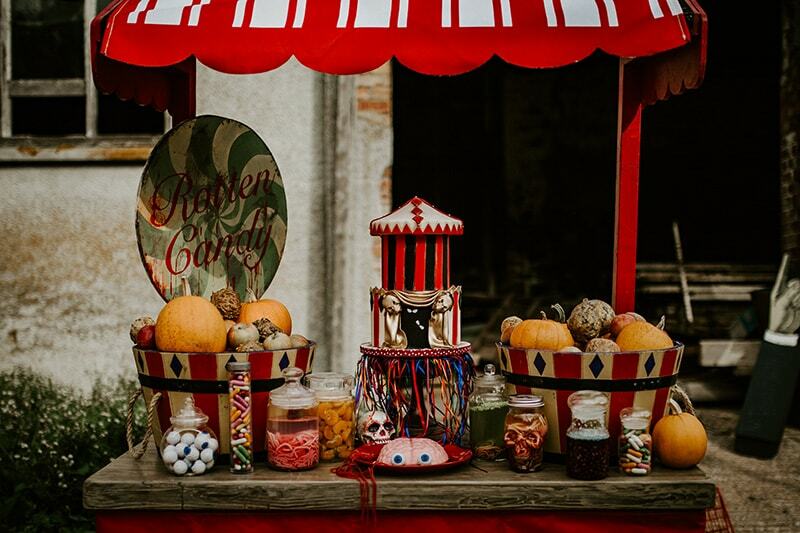 We filled our red confectionery stand and circus bars with gruesome and creative Halloween party foods which made great inspo for our customers and Carmen later created a blog around the adventures of creating this food on a budget. 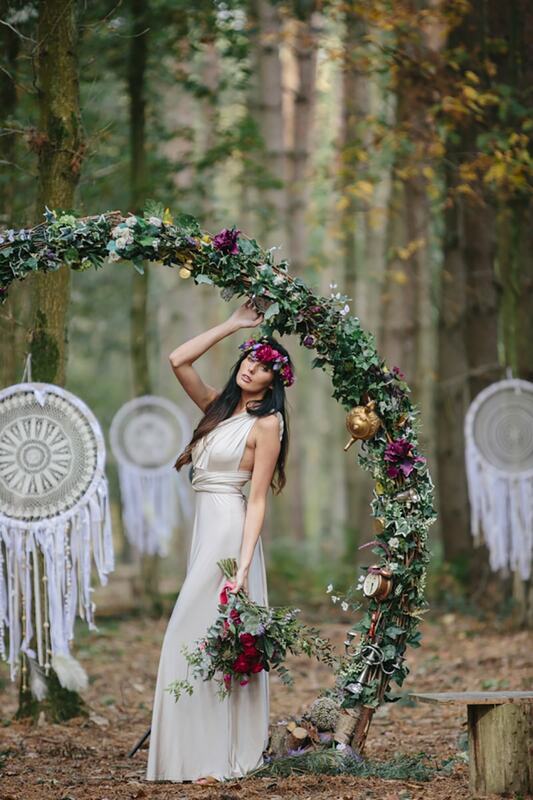 Number 15 of my top 20 photos brings to mind a ceremony area in surrounded by of pretty woodland with our Enchanted Arch covered in flowers and whimsical trinkets surrounded by giant boho dream catchers! Our photoshoot, in collaboration with Enchanted Woodland Weddings' venue and World Inspired Tents created some dreamy wedding inspiration. In fact this image from that shoot had the most likes we've ever had on an Instagram post! 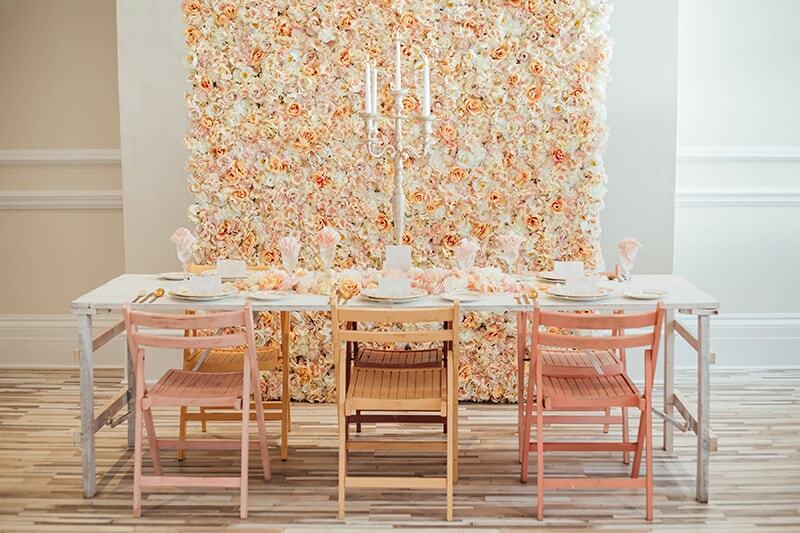 Pretty Blossoms on our flower wall and soft blush coloured chairs make you want to eat the furniture in this photo, placing it securely at number 16! The gold candelabras add a bit of elegance in amongst the runner of petals which match the wall perfectly. This photoshoot is very me and was a complete joy to set up, especially with the hospitality of the lovely Lucy at The Osborne Hotel, Torquay. A venture to Lodge Farm Barns in Essex for VV Raven's Bright Spring shoot gave me a fab opportunity to meet and work with new suppliers! The shoot included some of our most loved pieces, such as our blue velvet chesterfield sofa, wicker armchair, and rustic wooden chest. 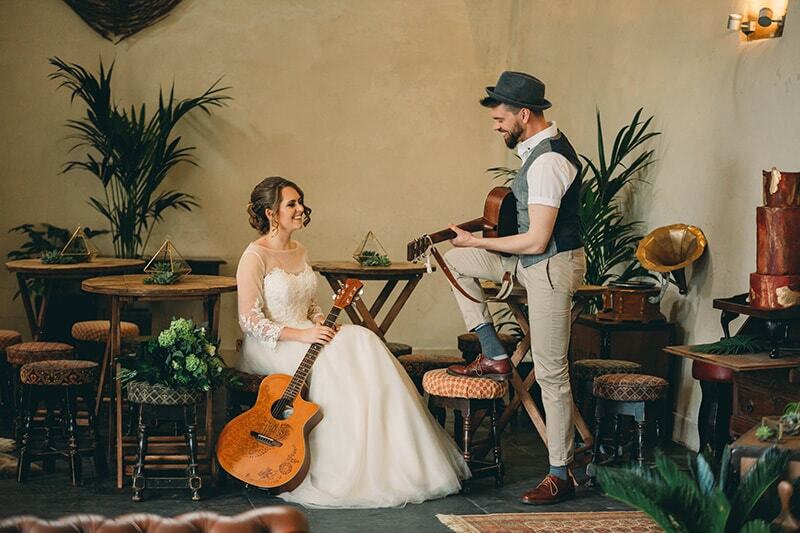 The florals and well-chosen artwork, mixed in with our props, transformed the old barn and this shoot had many features on some fab wedding blogs. I love the composition of our props and models in this photo particularly which is why I have chosen it for number 17 of my favourite photos for 2018. A very Royal set at the grand Kingston Estate finds itself well-placed at number 18. This shoot was a bit of a challenge as we created a room within a room using our Georgian Wall Panels. 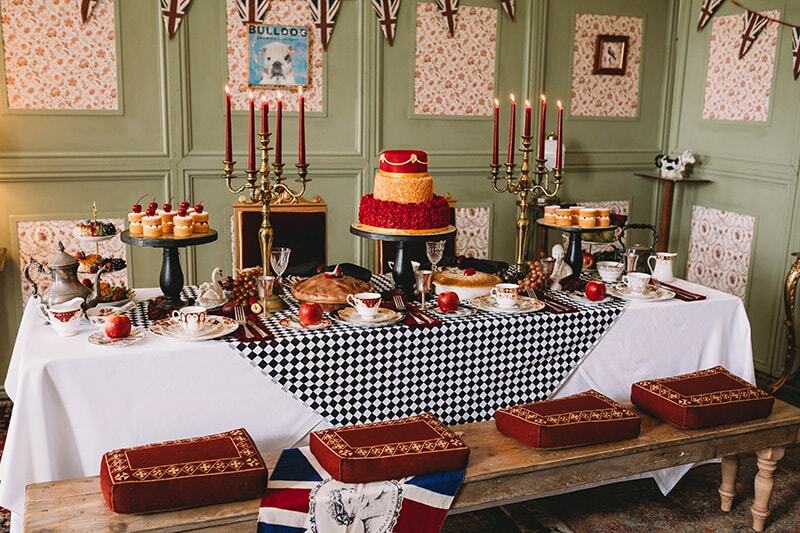 The shoot was inspired by our love of eclectic props and also the hype of the Royal Wedding. Our set and models had a very theatrical look with the banquet table full of indulgent cakes on our Clock Cake Stands. The red and gold Throne Chairs and embroidered rectangle cushions alongside our Farmhouse Bench gave it that royal atmosphere and was captured beautifully in this photo by SoBelle Photography. 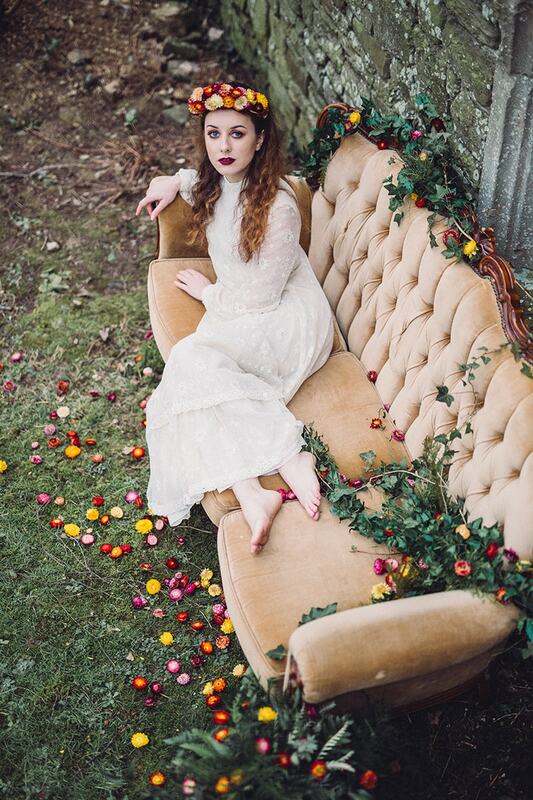 An Autumn-inspired shoot in Spring is my choice for number 19! 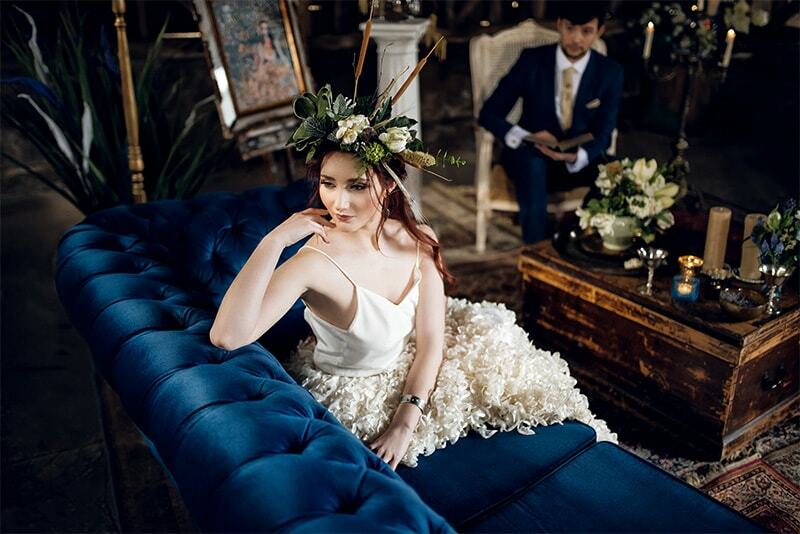 Our Wild Flower concept came about after I was given a bag of gorgeous dried flowers. The colours were so rich and autumnal I was tempted to throw them all over pieces of our furniture...and so I did! Providing a beautiful rustic setting, Ash Barton Estate in Barnstaple was an ideal location for its charm and building textures. I wanted to keep the shoot fairly simple with the purpose of showcasing one or 2 props in each scene, whilst also ensuring they were styled to perfection! The Camel Emily Sofa covered in ivy and foliage made it look a permanent feature of the grounds. The yummiest photoshoot and number 20 of 2018 was a Chocolate inspired set at Colehayes House. We made a burst of chocolate cake related props including a Chocolate Cake Slice Side Table, Chocolate Cake Pouffe, Chocolate Emily Sofa, Jam Tart Floor Seat and Giant Cookie! Setting the furniture against the dark wood panelled walls and caramel herringbone floor complimented the pieces so well; Carla from Daze of Glory then edited the images with a real richness, which made everything look good enough to eat! Well, there we have it: my top 21 (!) choices of 2018. It has been a real pleasure looking back through the photos and memories created this year and I can't wait to see what 2019 brings for The Prop Factory.